Rikkyo University, with its 135th year arriving in 2009, is moving toward international cooperation in the Asian region, taking advantage of the worldwide network of the Anglican Church. 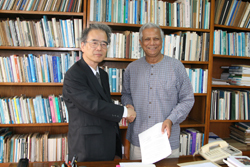 To this end, Rikkyo has made an academic exchange agreement with the University of Dhaka, and will reinforce coordination among NGOs centering on Grameen Bank (led by Muhammad Yunus, recipient of the 2006 Nobel Peace Prize), as well as partnership in fostering talents of young people working and planning to work in the field. Kiyoshi Kasahara, the vice president of Rikkyo University, paid a courtesy visit to President Iajuddin Ahmed at the capital in Bangladesh on August 7th. Kasahara expressed the policy of reinforcing coordination among NGOs working to alleviate poverty in Asia, as well as teaching young people, and appealed to President Ahmed for cooperation. Ahmed agreed on a partnership, praising Rikkyo’s initiative, and also showing his hope for friendship between Bangladesh and Japan. Kasahara later visited the University of Dhaka and Grameen Bank, and signed an academic exchange agreement. Muhammad Yunus, the president of Grameen Bank, said, “We will need to coordinate to foster the talents of NGO workers to alleviate poverty in Asia.” Yunus also attended the signing ceremony, and exchanged opinions about onward programs carried out within the agreement. 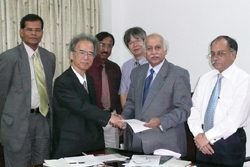 Kasahara had other meetings with Fazle Hasan Abed, the chairperson of BRAC (formerly known as the Bangladesh Rural Advancement Committee), and Mechai Viravaidya, the chairperson of PDA (Population and Community Development Association), seeing a consensus toward establishment of an agreement between Rikkyo University and Grameen Bank. Both NGOs are the most influential and large-scale in Bangladesh and Thailand, and Viravaidya was awarded the 2007 Nikkei Asia Award. In Asian countries, NGOs are playing the major and important roles of supporting governments in such fields as education, medical care, and social services. The technique for social entrepreneurship via the micro credit system (loan of a small amount with no collateral) by Grameen Bank is widely utilized as a countermeasure to poverty in Bangladesh and Thailand. It is said that the system has contributed to economic independence of more than seven million persons who suffered from poverty in Bangladesh. Rikkyo University is the first institution or organization from Japan to make an agreement on academic exchange and to help foster talents of the leading NGOs in Asia. Rikkyo University has awarded an honorary doctorate to Muhammad Yunus in 2007.